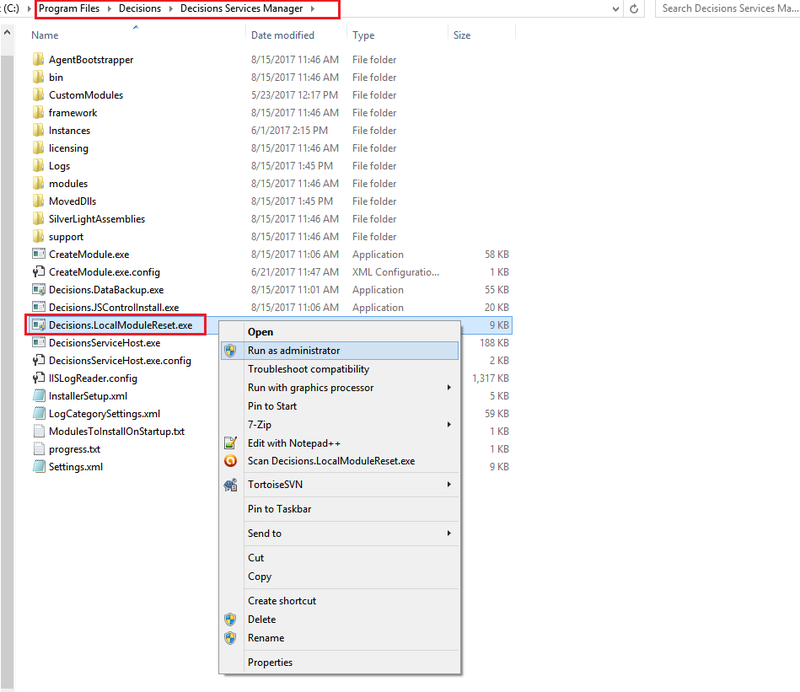 This tutorial demonstrates how to reset Local Modules	to remove or update custom DLLs using Decisions.LocalModuleReset.exe	tool. To learn how to deploy custom DLLs, please click here . This tool is important because by design Decisions stores custom DLLs in the database so a Decisions High Availability Cluster can have these DLLs applied to all nodes within the cluster without having to apply DLLs manually to all servers within that cluster. 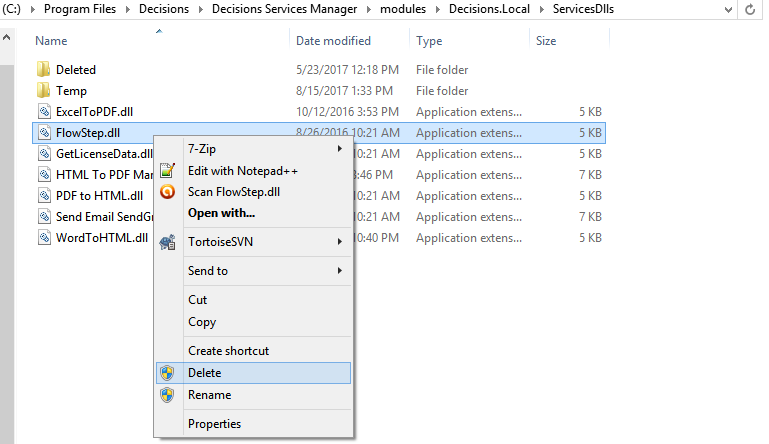 On startup of Decisions any custom DLL in the C:\Program Files\Decisions\Decisions Services Manager\modules\Decisions.Local\ServicesDlls	directory will be automatically added back into Decisions . Therefore, it is important to useDecisions.LocalModuleReset.exe	tool to avoid unexpected results while updating or deleting custom DLLs . In this example we have a simple custom FlowStep.dll	located inC:\Program Files\Decisions\Decisions Services Manager\modules\Decisions.Local\ServicesDlls	directory. Our goal is to remove this custom step. First, we need to stop Service Host Manager	located in Windows Local Services. After Service Host Manager is stopped we delete FlowStep.dll	file. 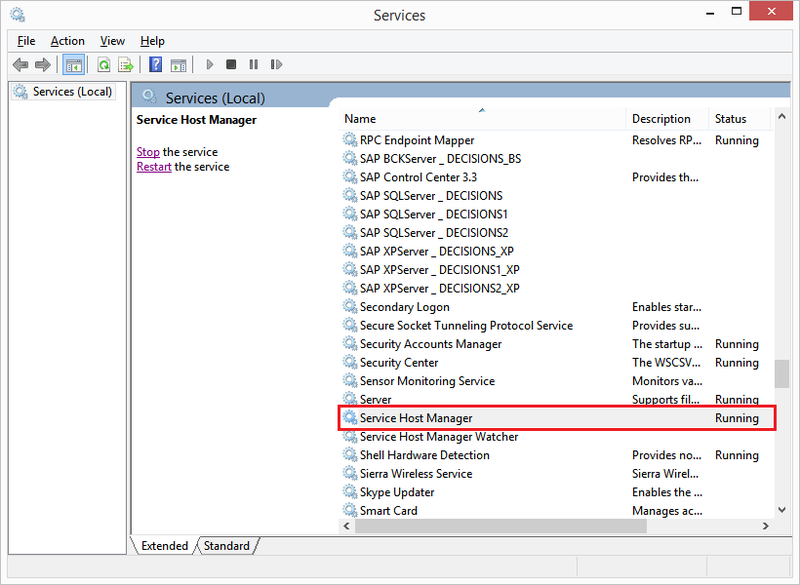 …And we can start Service Host Manager	back up. At this point we will receive unexpected results. 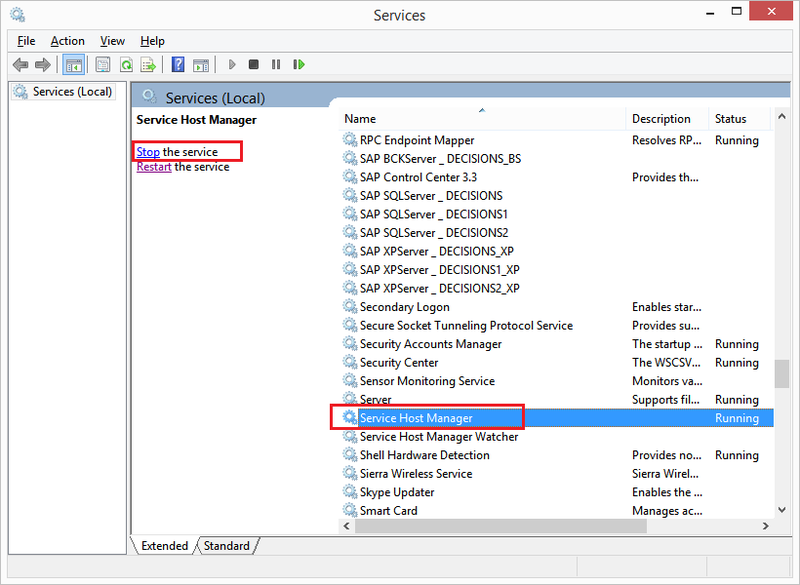 Service Host Manager	may fail to start because our custom DLL is missing, or our custom DLL may come back from the database. To avoid these unexpected results, each time we delete or update custom DLLs we need to run Decisions.LocalModuleReset.exe	tool (as Administrator)	located in in C:\Program Files\Decisions\Decisions Services Manager	(in default installation). And, it starts without errors and with all our custom DLLs updated.